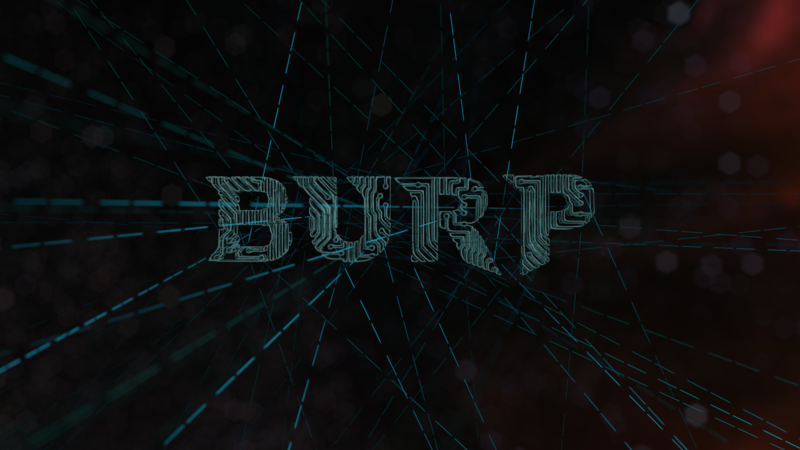 Message boards : Website : BURP logo ? Does BURP have a logo ? Is it the kind of trefoil knot at the top of the page ? Would be nice to have an uncropped, transparent logo so we could put it at the end of our videos for which we used the farm. If there isn't any, maybe I could give it a try ? Yup, that's our "logo", it was given to BURP as part of a website design challenge long ago and it kinda stuck with us because it looks pretty cool. One unfortunate side-effect of that is that we don't actually have any higher-res version than the one at the top of the page. Message 14969 - Posted: 20 Dec 2016, 16:08:01 UTC - in response to Message 14951. Well it looks nice, but it's more of an image than a logo. More importantly, it doesn't give any clue about what BURP is. The first time I came accross this website looking for a free collaborative renderfarm for Blender, I was not sure I just found it by seeing the home page and I had to come back a second time and read some more pages to be sure that's what I was looking for. Maybe I missed the "What we do" at the bottom of the page, but maybe showing very clearly what this site is all about on the home page without having to scroll down would prevent some people from leaving this site before understanding what BURP is. • First, there's very few text and the only real line of text says : "SheepIt is a free distributed renderfarm for Blender. Try it now!" without having to scroll down. • Second, there's the Blender logo inside the Sheep it logo. There's even a very classic representation of a cloud server in it. I'm sure the way the sheep's wool was illustrated is not a coincidence. And if it is, they should keep it. Because yes, there is a server that stores your blend file and render results. I've come accross much more people who know Sheep it than people who know BURP. I still don't know how many active BURP users there are as it seems more difficult to know because of how BOINC works, but it seems Sheep it is much more famous. It now has a bunch of tutorials on youtube, including from notorious tutorial makers like Zacharias Reinhardt. But for BURP there isn't any (I plan to make one when I'm ready). The point is, I think there is some work to be done on the website, including the header image (or maybe a new logo) to give more visibility to the project. So I've started some research and came accross some ideas for images and logos (all the images I've made are quite rudimentary since I don't even know if you're open to changing anything). At first I thought of keeping the trefoil knot and adding some lines that join towards it, since I think there should be at least a concept of connection that generates something. 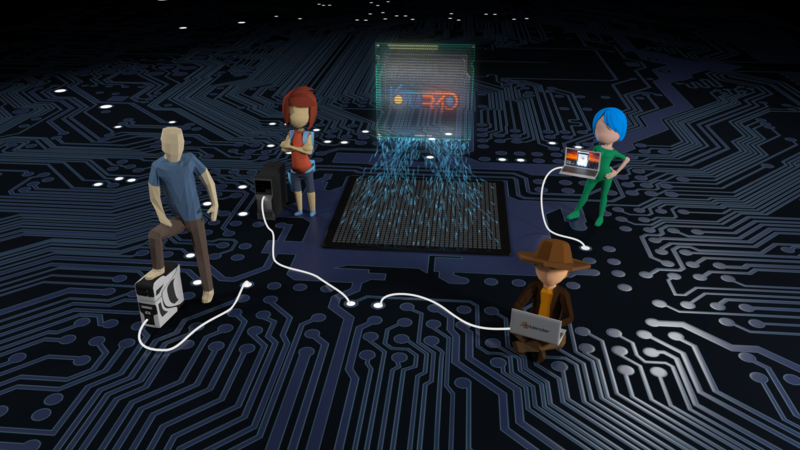 The lighting, materials and assets are also very quickly made or downloaded and the way the computers are connected may not be clear enough. But the idea is : there's the blender logo inside the BURP logo (and on the guy's laptop), the characters look like they're teaming up and the signals join to make a virtual giant processor. Which is not technically what BURP is but I'm not sure we can get more technical here. That's about it for the moment. If you're open to making a new image or logo, I'm willing to spend more time on it (not in the holidays but later). Otherwise, well, that was fun anyway. Just a couple of short notes as things are winding up to the Xmas+New Years celebrations where not much will happen here in the forums. 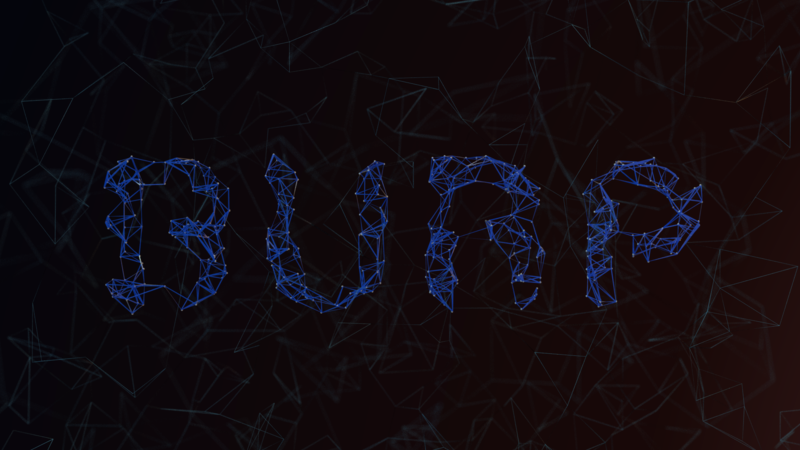 1) BURP is actually two things in one: It is both a development project to create a platform for creating renderfarms and an example community based renderfarm based on that platform. BURP (the renderfarm) is not the only BURP (the software) based project, and historically not even the biggest one in terms of number of participants. 2) BURP is not as tightly coupled with Blender as it may seem. In fact Blender is not the first rendering engine supported by BURP - it just so happens to be one that fits very well with the open nature of the example renderfarm. 4) There will be no use of Blender's logo (modified or otherwise) in the logo. Ton doesn't quite like it and, although there's nothing stopping us from doing it anyways, I kinda respect that guy. It has been almost impossible to print the logo on T-Shirts or paper because it has no set boundary and the colours are hard to match. The current logo doesn't work in black/white (like what you typically see at the very end of credit scrolls on some movies) because the structure is 3D rather than flat. The structure isn't particularly well-defined. It still looks pretty cool. Don't take (3) as "don't want a community". That is wrong. It is more of a way of limiting the size of the project to people who are interested enough in it - at least while the project is still in beta. Message 14971 - Posted: 21 Dec 2016, 11:53:25 UTC - in response to Message 14970. Thanks. That makes sense and I understand what you mean. So if any change would be done, it would be either along my first proposition or the last 2 or something else. 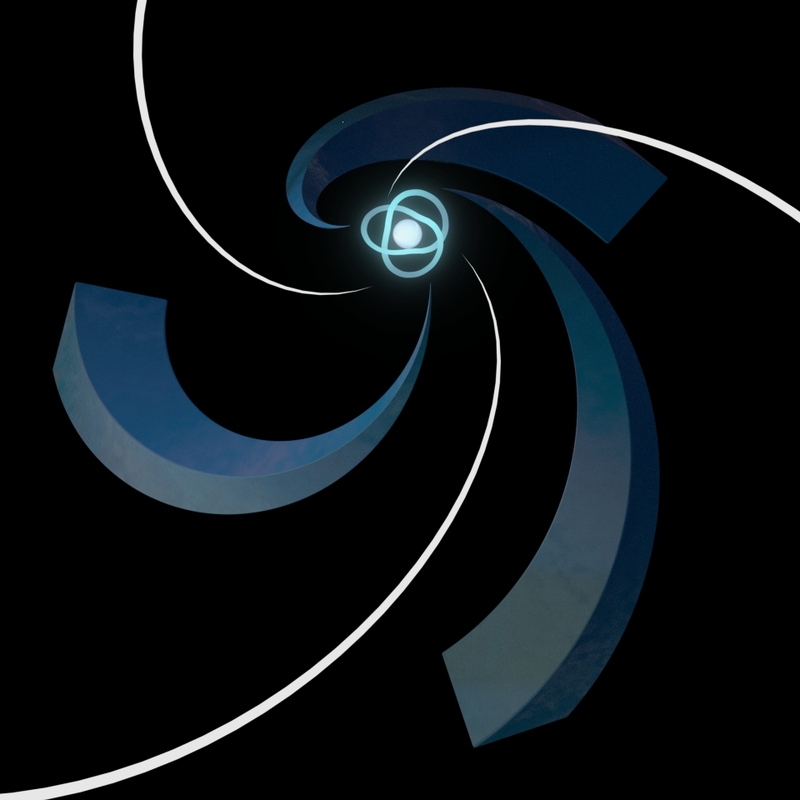 I find the first one too generic to be a recognizable logo and the last 2 are more of a font than a logo, although that's not necessarily a problem (i.e Renderman has lost its bouncing ball and left place to a simple font on the name, which we now see in movie end credits). But although you precised some issues with the current logo, you didn't really say if a new one would be conceivable. I would still be glad to make some research on it, and now that I understand some things better , I may have more adequate ideas. Message 14972 - Posted: 21 Dec 2016, 13:15:51 UTC - in response to Message 14969. Message 14973 - Posted: 23 Dec 2016, 2:31:05 UTC - in response to Message 14970. As a side note, there was another BOINC-based project that used the BURP software and had many more users and completed sessions, Renderfarm.fi. But, like a supernova, it burned hot and bright for a very short period of time then pretty much imploded and all traces of it have since disappeared. They were much more aggressive with their marketing in the Blender circles, and things were good until they just completely stopped one day without warning. I never really heard an explanation of what happened; since the project was associated with an educational institution, I assume it was funding/staff-related. Message 15078 - Posted: 18 Feb 2017, 2:38:12 UTC - in response to Message 14973. Yeah I find the death of renderfarm.fi pretty curious too and when I was looking for such a thing (free rendarfarm) it took me quite some time to understand it was dead as it was not made very clear anywhere.